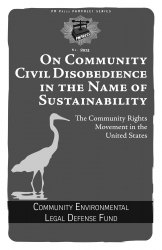 In CELDF’s new publication, On Community Civil Disobedience in the Name of Sustainability: The Community Rights Movement in the United States, we examine the failure of our environmental laws. We examine how our legal and governing structures promote and support endless extraction and production, and make environmental sustainability illegal. And we explore how communities across the U.S. are advancing a new structure based on community rights and the rights of nature, and are joining together to drive change from the local to the state and national level. A fundamentally different approach to environmental protection and sustainability is needed. This means building a new people’s movement for the environment. CELDF is pioneering this work, beginning with Pennsylvania communities over a decade ago, and today expanding across the country. On Community Civil Disobedience in the Name of Sustainability is both a challenge to traditional thinking of what the problems are that we face – and an invitation to help grow community rights into the thousands of communities that are necessary to avert a planetary crisis and build true sustainability.